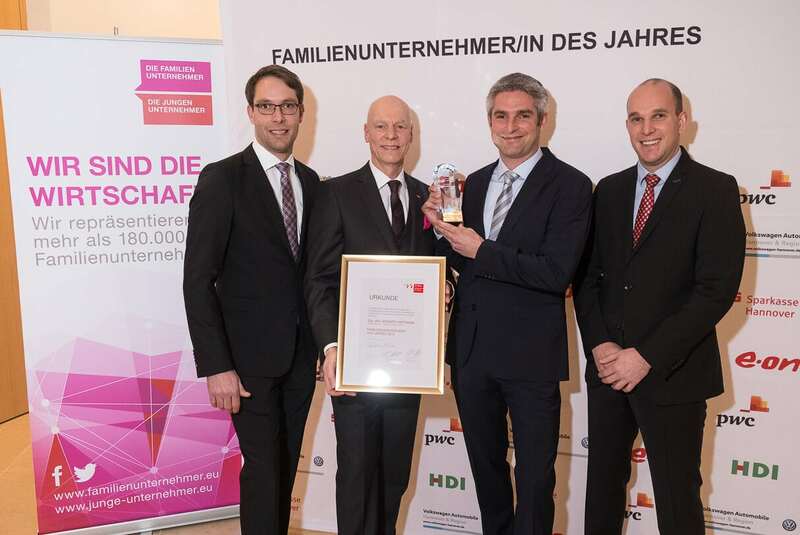 The award „Family Entrepreneur of the Year 2019“ was given to Werner Hartmann, who is leading the family-owned enterprise Hartmann Valves together with his brothers Christian and Martin Hartmann as the third generation. The association „The Family Entrepreneurs“ of Hanover region thereby recognizes the managing directors for their outstanding entrepreneurship and employee-orientated leadership. Picture: Andreas Pralle (2.l. ), president of „The Family Entrepreneurs“ of Hanover region hands the award to Werner Hartmann (2.r. ), who is glad to accept it together with his brothers Christian (l.) and Martin (r.).